The Home Oxygen Assessment service assesses, prescribes, reviews and follows up patients in Oxfordshire requiring oxygen at home. 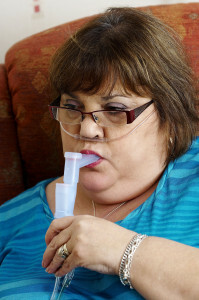 When patients with respiratory problems and other conditions such as heart disease are thought to need oxygen, they are referred to the service who will assess them at home or in a specialised oxygen clinic to determine whether oxygen is appropriate and if so, order the supply and provide support and follow up for the patient. Patients can also be assessed in hospital to see if they need to go home with oxygen. The service also reviews all patients currently receiving oxygen to determine what supply is appropriate for their condition and will support and follow up those patients. The Home Oxygen Assessment Service enables all patients to be assessed and supported by a team of respiratory nurses, with hospital consultant support where necessary. Patients benefit by receiving the optimum oxygen therapy to meet their needs. High quality home oxygen treatment is available to all who need it, and the service ensures this is supplied through the most cost effective route.